In Greek, Mesopotamia means the land “between the rivers”. The two rivers the Tigris and the Euphrates are in modern Iraq, turkey, and Syria. The name Mesopotamia first appears in the fourth century BC, and it meant the land on the north Syria, east of the Euphrates. The name was first changed after 630’s when Muslims conquered the area and changed the name to Iraq and Islam religion dominated the area. Mesopotamia had different cities and regions and they all had their own special geography and their own natural resources determining how the people of the area lived. 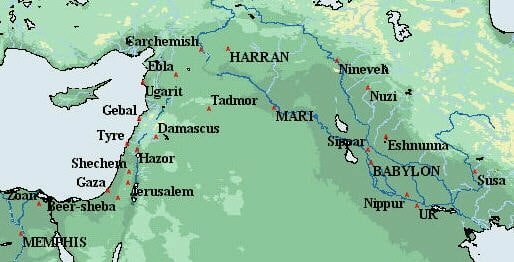 The northern region or upper Mesopotamia was a fertile land because of the seasonal rain and rivers flowing down from the mountains. The rivers flowing down from the mountains also gave the people of northern Mesopotamia the possibility of irrigation. There has been an evidence of irrigation in a bigger scale in the human history. The vast plains cut in half by the limestone that rises suddenly in the plains. It was densely populated. Today it is just a place of bush and trees. Southern Mesopotamia was marshy land and many flat barren plains. Cities were developed along the rivers and irrigation was used in bundles to try and grow something on the infertile plains. Since the settlers in this area did not have any natural resources, they had to have much contact with settlers in other areas in order to trade and have enough food to support their families. Southern Mesopotamia was also known as lower Mesopotamia. It was the home to the Chaldean marshes, the river of Babylon, the inland freshwater sea of Naja, and was surrounded by red sandstone cliffs standing high above the ground. There was a primitive seaport named Eridu in the south of Ur on the western bank of Euphrates, but today this location is approximately 130 miles from the sea. Due to the silting up of the shore, the city’s function as a harbor ceased to exist. The first permanent settlements known was found in the lower Mesopotamia and this is why this place is known as the cradle of civilization. The land was so fertile that crops could be harvested twice a year and the third harvest was used for feeding the livestock owned by the inhabitants. The population in both upper and lower Mesopotamia increased and the inhabitants changed the landscape from being a swamp not fit for human habitation to an extremely fertile area. They covered the lands by a network of canals making sure agriculture was possible all over, and the canals were planned and executed with skill and great ingenuity benefitting their entire population ensuring them the possibility to get the most out of the fertile lands. The war between Iran and Iraq in the 1980´s was one of the many conflicts in this area. Oil is another reason for conflicts. Perhaps the future will hold something better for the cradle of civilization. Only time will tell, but the geography and the history of Mesopotamia show that the possibility to change the land once more to its state of prime and fertility is not impossible and hopefully this will happen sooner than later.